While panini literally means “little bread,” you’ll need more than a small slice to contain this sandwich’s big personality. A homemade honey Dijon sauce, quality meat and cheese, and fresh arugula and pear prove that when it comes to creating a noteworthy panini, less is more. Combine honey and Dijon in a bowl; season with salt and pepper. Trim top and bottom crusts from bread to make flat surfaces (save for bread crumbs or croutons); slice trimmed loaf in half horizontally. Arrange fontina on bottom slice. Spread half of honey Dijon on top of fontina. Layer prosciutto, pear, and arugula on top of honey Dijon. Spread remaining honey Dijon on top bread slice, then place, honey Dijon side down, on top of panini. Preheat grill pan or cast-iron skillet over medium-high. Brush both sides of panini with oil; season with salt and pepper. Transfer panini to pan. Place a sheet of parchment and a heavy skillet on top of panini to weigh it down. Grill panini until cheese melts and bread is golden brown, about 3 minutes per side. For flat grilling surfaces, use a serrated knife to trim the top and bottom crusts off of the bread. Flatten and crisp the panini by weighing it down with a skillet (if needed, add cans for more weight). 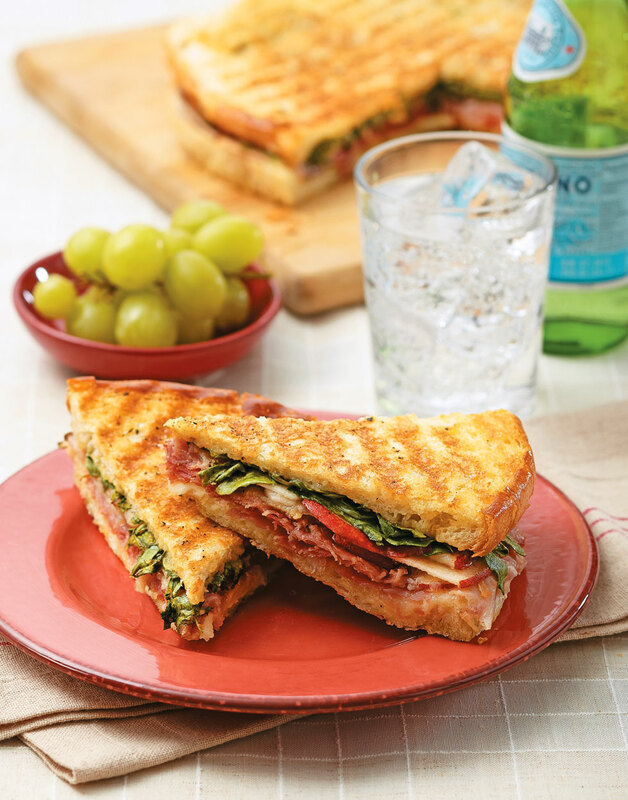 Slide a spatula underneath the panini with your hand placed gently on top, then flip it over.